Bonefish, Bonefish, Bonefish... Sshhhh... they can be gone in an instant! 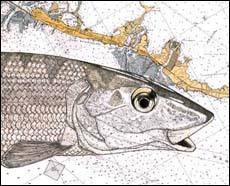 The elusive bonefish. It's at the top of every Flat's Fishing Angler's list. There are many reasons it's known as the "Grey Ghost". They're not easy to find. 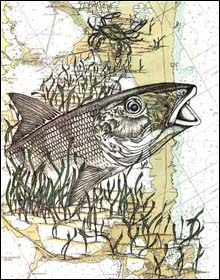 Move too fast, make some noise--no more Bonefish. I've even heard people make jokes that they don't really exist because they've caught everything else on the Flats and just don't have an excuse for that missing Silver Bullet. 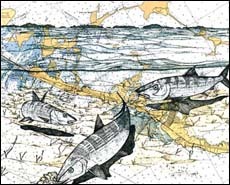 In the Florida Keys, it seems that Islamorada hosts more Bonefish Tournaments than anywhere else. 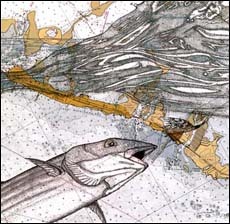 The Nautical Charts for most of these designs cover the Plantation Key, Islamorada and Upper Matecumbe areas of the Florida Keys. 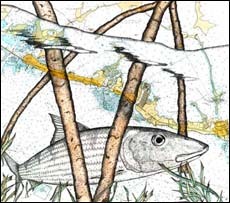 In just a few inches of water you might find a "Bonefish Trio." In "Wishbones," this one's about to make a very long, very fast run for it! Up close and personal with a "Single Bonefish." Bonefish like to eat shrimp, shellfish and crabs, but can always be tempted like this "Bonefish w/Fly" by some expertly tied Flies. 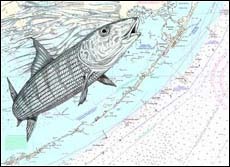 "At the Surface" shows you some great Bonefish spots Oceanside and Bayside throughout the Florida Keys. 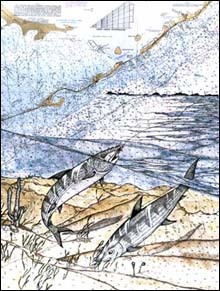 That Bonefish is checking out a passing fly while a tasty crab "passes" by....in "Fly by Bonefish."